Director – Jan de Bont, Screenplay – Anne-Marie & Michael Crichton, Producers – Michael Crichton, Ian Bryce & Kathleen Kennedy, Photography – Jack N. Green, Music – Mark Mancina, Visual Effects – Industrial Light and Magic (Supervisor – Stefan Fangmeier), Special Effects Supervisor – John Frazier, Production Design – Joseph Nemec III. Production Company – Amblin. Dr Jo Harding heads a team of scientists who follow tornadoes in an attempt to study them. While out in the field, she is visited by her estranged husband and former colleague Bill who now works as a tv weatherman. He has come with his new e, psychologist Dr Melissa Reese, to get Jo to sign their divorce papers. While he is there, Jo shows Bill their dream project, which he helped design – a container designed to release dozens of sensors into the heart of a tornado and provide valuable information on its interior. Bill then becomes caught up in the dangerous, death-defying race to beat a rival and be the first to release the sensors directly into the tornado. Twister comes from the pen of Michael Crichton. Ever since the mega-success of Jurassic Park (1993), Crichton’s work became hot property and the source of a number of blockbuster films. Crichton for a time became the new boy of Steven Spielberg’s Amblin stables with Amblin having produced the Crichton-created tv series ER (1996-2009) and Twister, as well as the adaptation of Crichton’s Congo (1995) made by Spielberg’s producers Kathleen Kennedy and Frank Marshall. Twister was the first screenplay that Michael Crichton had written directly for the screen since 1984. (See below for Michael Crichton’s other films). Michael Crichton co-wrote Twister with his then wife Anne-Marie (formerly actress Anne-Marie Johnson who achieved her greatest moment of fame as Dory Doreau in the cult tv series Sledge Hammer (1986-8) and before that was known as B-movie actress Eddie Benton). Perhaps it is the feminine influence but Twister seems a much more human story than the ones Michael Crichton usually serves up. 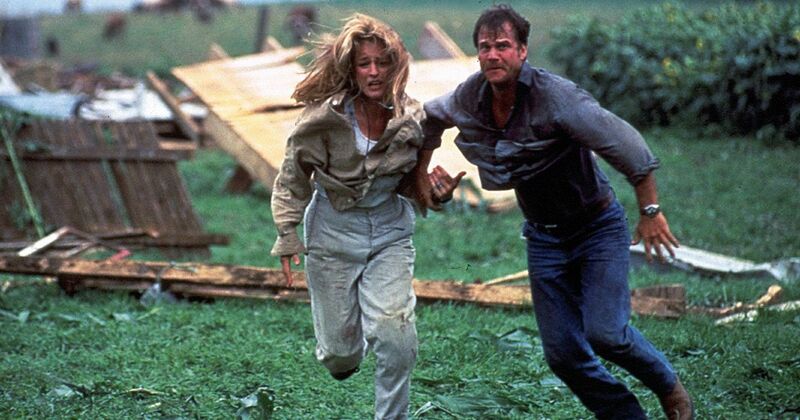 Indeed, Twister reminds a considerable deal of The Abyss (1989) with its backstory to the action about the reconciliation of a separated husband and wife. Unfortunately, while the human element is more integral to the story than it usually is in a Michael Crichton work, the relationship treads a predictable arc – there is no surprise to the fact when Bill Paxton and Helen Hunt do get back together. Twister was slammed by many people for its lack of story, which is perhaps overstatement. Nevertheless, the film does head in some predictable areas, not the least of which is the caricaturing of the villain of the piece. It is not a story that suits itself to a villain and Cary Elwes’s character gets stretched out of shape in order to have to fit the bill – he is an egotist and a publicity seeker, has corporate backing instead of university funding and, in the most laughable piece of caricature, he and his team drive in a convoy of black vans. Nevertheless, story is not the greatest consideration in Twister. The film has been designed with the sole intent of providing a series of mass spectacles for an audience on an ever-expanding scale and does not disappoint in this regard. The scenes of mass destruction – with twisters ripping up drive-in theatres, plowing through houses, sweeping up tractors and tossing cows (Jami Gertz’s stunned reaction to such is priceless) and exploding oil tankers into the path of the heroes’ vehicle – are absolutely stunning. The special effects work is exceptional. The film is also a triumph of the Dolby surround sound process. Whether Twister is a science-fiction film is a debatable question – the technology on display is well within the realms of possibility and tornado chasing is an existing meteorological discipline. Nevertheless, the manner in which Michael Crichton and the film treats the spectacle is solidly rooted in science-fiction. 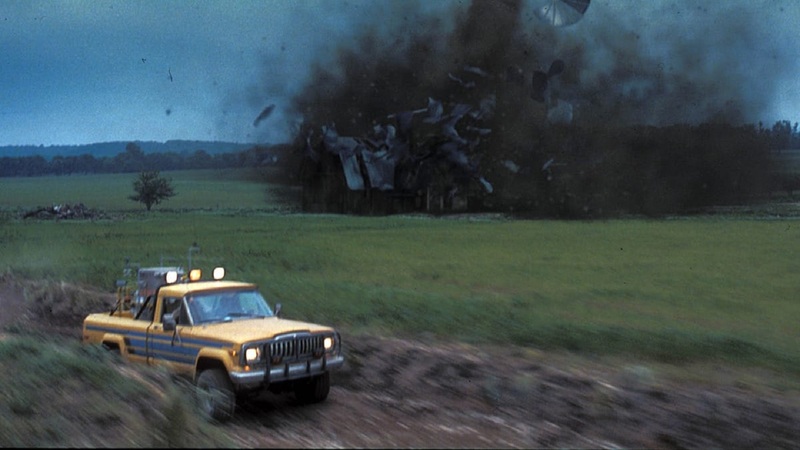 Most interestingly, the film treats the penetration of the twister’s interior as a transcendental breakthrough – the scene where Bill Paxton and Helen Hunt glimpse up into the eye of twister while tied to the pipe is a scene of awe in exactly the same way that the appearance of the UFOs at the climax of Close Encounters of the Third Kind (1977) or the trip into the stargate in 2001: A Space Odyssey (1968) is. Although, Twister does stumble over into a maudlin sense of wonder upon this occasion – when the sensors are finally released up into the twister, they give off a glow of Spielbergian light as they disappear in a trail of Tinkerbell lights up into the heavens. It is as though the Spielberg influence had to assert itself somewhere on the film. Twister was directed by the Dutch-born Jan de Bont, a former cinematographer on films like Die Hard (1988), Flatliners (1990), The Hunt for Red October (1990) and Basic Instinct (1992). Jan de Bont made his directorial debut with the ridiculous Speed (1994) and subsequently went onto the mind-numbing Speed 2: Cruise Control (1997), the abysmal remake of The Haunting (1999) and Lara Croft, Tomb Raider; The Cradle of Life (2003). Indeed, Twister is the only of Jan de Bont’s directorial outings that is actually a halfway decent film. Other films adapted from Michael Crichton’s books are: – The Andromeda Strain (1971) about an extra-terrestrial virus; The Terminal Man (1974) about a epileptic who is transformed into a killer by attempts to control his seizures; Jurassic Park (1993); Rising Sun (1993), a superior adaptation of Crichton’s blatantly racist book about Japanese business practice; Barry Levinson’s adaptation of Disclosure (1994), Crichton’s novel about sexual harassment, which contains some sf elements; the lost world film Congo (1995); The Lost World: Jurassic Park (1997); Levinson’s underrated Sphere (1998) about the investigation of a crashed UFO; John McTiernan’s The 13th Warrior (1999), an historical epic about the meeting between Vikings and Neanderthals; Timeline (2003), Richard Donner’s dull adaptation of Crichton’s novel about time travel; the tv mini-series remake of The Andromeda Strain (2008); and the tv mini-series remake of Westworld (2016– ). Michael Crichton’s films as director are Westworld (1973) about an android amusement park that goes amok, the medical conspiracy thriller Coma (1978), The Great Train Robbery (1979) about a Victorian train heist, Looker (1981) about virtual models, Runaway (1984) about a police force to stop amok robots, and the courtroom thriller Physical Evidence (1989). (Winner for Best Special Effects, Nominee for Best Actress (Helen Hunt) at this site’s Best of 1996 Awards).